← Syrian Christian leaders plead with the USA to stop arming the rebels! Syrian Christian leaders create a stir in Washington! It’s not often that Christian bishops have US politicians walking out on them and shouting! According to the Judicial Watch blog though this is exactly the treatment visiting Syrian church leaders received from one US Senator in a recent briefing held in Washington D.C.! And perhaps the most disturbing thing is that the tantrum wasn’t thrown by some naive hillbilly senator who couldn’t be expected to know any better. 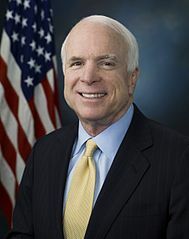 It was Senator John McCain – the Republican Presidential candidate of 2008! What was it that so upset McCain that he allegedly marched into the committee room yelling and then quickly stormed out? One can only assume that the Syrian clerics were saying things that McCain didn’t want to hear. It seems that the church in Syria is united in their desire to put an end to foreign intervention in their country and to allow Syrians to determine the future of Syria. This is evidently completely unacceptable to McCain and his colleagues who want to pour more arms into the country. I’ve included below a video of a presentation of the visiting churchmen in Washington. It’s a long piece, going for more than an hour. Even so, I’d encourage you to listen to each of these Syrian Christian leaders and see if you can hear anything obviously inflammatory in what they say. There is one reference made to their refusal to accept foreign mercenaries in their country, sent in by Saudi Arabia, Qatar and Turkey. Apart from that there is very little of an overtly political nature mentioned at all. Perhaps what McCain finds hard to swallow is simply the fact that there are evidently plenty of good men (and women and children) who are a part of his own religious tribe who are being targeted by the weapons he is pouring into Syria. It’s always easier to live with what you’re doing if you can’t see the faces of the persons you’re killing. Apparently other senators apologised to the visiting church leaders for McCain’s behavior. That’s encouraging but I’d sooner see the US apologise for its role in the destruction of their homeland. This entry was posted in syria news, syrian civil war and tagged saudi arabia, Senator John, syria, Syrian Christian, syrian church, syrian civil war, US. Bookmark the permalink.